For most of its years, Great Western Arms offered an unusual catalog item, the ‘build it yourself’ kit revolver. The kit gun was the drilled and tapped frame plus loose parts to build one Great Western sixgun. Boxed and with instructions, it was to be assembled by the buyer. The discount for the kit was generally $20 less than the MSRP for a factory completed Great Western. The GW kit gun conforms neatly to a 50’s do-it-yourself zeitgeist, but its inspiration was probably a response to Great Western’s overarching business problem: the market would not allow them to price their revolvers high enough to clear a profit over the domestic labor cost to build them. With kits Great Western commercialized their abundant raw parts stream for retail without incurring worker expense for finish and assembly. The Blue Book entry for Great Western notes that perhaps 1000 kits were shipped (Dougan). True or not, this amount of units sold over several years offered no real hope to make Great Western Arms solvent. In the end, the ‘kit’ concept was probably used to liquidate guns staged for factory assembly when Great Western Arms went out of business. Serial ranges: Kits were first offered as a catalog item in 1956. Within the standard serial range, the first kits with 0 prefix are observed at about 0134xx. The last kits with a 0 prefix are observed at about GW0214xx. This is at the end of Great Western’s operations in 1962. Calibers: Probably all, including the rarest, like .44-40 and .45 ACP. Barrels: 4.75, 5.5, and 7.5. 5.5 are most common. Grips: Mostly plastic faux stag, but late kits can be seen with high quality genuine stag, ivory, and mother of pearl, which were offered at appealing prices during a 1961 kit sales campaign in Shotgun News. Overall production \ scarcity: Production could have been 1000, as the Blue Book says, but they are not encountered on the used market today as if that many sold. It may be that many were completed unsatisfactorily and subsequently discarded \ scrapped. Type 1, 1956 – 1959, found in serial range 13500 – 19000 or so. The original kit had the barrel installed to the cylinder frame. Frame, trigger guard, and backstrap were tapped with proper screw holes, but were otherwise rough as cast and not serial matched to frame. An assembled but unpolished or finished Great Western Arms kit revolver in .22 caliber. This one is from 1956. Type 2, 1960, found in serial range 19000 – GW 20750 or so. Backstrap and trigger guard are installed to the frame and edge mated, making the kit a bit easier for the amateur to polish out. These components are serial matched to the frame. Type 3, 1961, found in serial range GW20750 – GW21250 or so. Backstrap and trigger guard are installed to frame and edge mated, with these components all serialed. The revolver frame assembly is polished for bluing. Action is not installed. This version correlates to a sales campaign to sell kits in Shotgun News over the summer of 1961. It’s correct to understand these as the ‘liquidation series’ kit package, as GWA was basically being liquidated. 3 kits revolvers that were never blued. The bottom two are factory polished, as they were sold in conjunction with the later kit sales campaigns. Type 4, 1961 and after, found in serial range GW21000 – GW22000 and after. Revolver is complete, and has been polished and blued, but action is not installed. Its likely some of these guns don’t have ‘0’ serial kit prefixes. Rather, they were guns staged for factory assembly and have regular serials, but were liquidated as ‘kits’ when the Great Western business deteriorated in 1962. By 1961 E&M found they couldn’t build the Great Western revolver price competitive with the German imports, and began winding down the GW business. Parts inventories were packaged as kits for liquidation, the start of this effort commencing with this Shotgun News ad in August 1961. E&M’s close out of Great Western inventories extended through the fall of 1961. The September Shotgun News campaign offers steep volume discounts and very low prices for exotic grips. This type 4 .45 kit is much like it was sold, polished and blued. The action was probably left for the buyer to install. 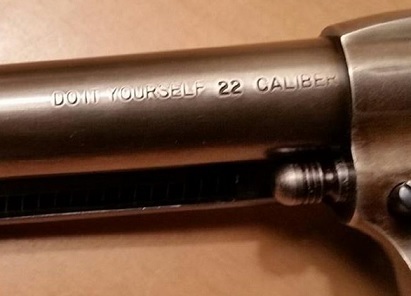 “DO IT YOURSELF” rollmark: some kits in the 19000 – 20500 serial range have a ‘DO IT YOURSELF’ rollmark on the barrel to the left of the caliber rollmark. The “DO IT YOURSELF” rollmark appeared briefly on 19000 – 20500 sn kits. Gold, chrome, or brass accents: within the type 3 range, kits are often found with chrome or ‘gold’ plated grips assemblies and / or ejectors. Some use the brass ‘fast draw’ trigger guard. Factory finishes on kits: It’s somewhat casually assumed that all Great Western kit packages were sold in the white, without finish. This was actually quite often not the case. They were frequently sold with a finish, though in any event the kits did still require assembly. Early, Great Western would polish and blue / nickel the kit for $5 if the customer chose that upgrade option. At the end, the kits were polished and blued, though crudely / haphazardly. Later year (1961+) kit examples with deficient blue or nickel jobs were probably all done by the Great Western factory rather than by the amateur buyer / assembler of the kit. Fast Draw kits: These probably exist, but the collector community seems to lack for an example with a 0 or GW0 kit prefix. They were advertised late in the company’s operation, so it may be that those Fast Draw kits sold then did not have a kit prefix indicator (see Type 4 kit variant note). Kit boxes: Kits were supplied in the standard box Great Western used at any given time. From 1956 – 60, this was the brown leatherette box. In 1961, this was the blue craft box. In 1961 – 63 Great Western used a white cardboard box. For kits, the boxes were labeled ‘kit’ and an instruction booklet was included. Collectability: The Great Western kit gun is so unique that it ought to make for a compelling collectible. Fact is however, they have not been warmly regarded over the years. When beset with functional problems or blemishes that come from amateur assembly, they tend to sell for less than parts gun prices. Hard or impossible to find: Unassembled kits, boxes with intact kit labels, and kit instructions. An unassembled Great western .45 kit basically as it would look out of the box.